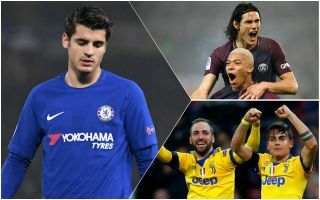 With the Alvaro Morata transfer rumours gathering pace, it’s worth looking at five strikers Chelsea could turn to to replace the misfiring Spaniard this summer. It seems pretty clear the Blues need a change up front after a hugely disappointing first season at Stamford Bridge from Morata, who looks nowhere near the standard required to fill the void left by Diego Costa. The Spain international managed just 15 goals in 48 appearances for Chelsea in 2017/18, and did himself no favours by missing some notable big chances at important moments. Calciomercato now report that AC Milan are interested in Morata, while another report from the same source snapped the 25-year-old chatting with Juventus officials. One of the very best strikers in the world, Robert Lewandowski has scored 151 goals in just 195 appearances for Bayern Munich as he’s linked with a move away this summer. The Telegraph have recently linked the Blues with an interest in signing the Poland international for £100million, which would certainly be a deal to get fans on their feet at Stamford Bridge again. It’s conceivable that Lewandowski may feel it’s time for a new challenge after taking German football by storm for so much of his career, and it would be great for neutrals as well to see him strut his stuff in the Premier League. A recent report from Tuttosport, translated by the Metro, also links Chelsea with an interest in PSG striker Edinson Cavani in what would be another exciting move. The Uruguay international, like Lewandowski, has been one of the game’s most reliably prolific centre-forwards of the last few years and he’d surely smash it in English football. Tall, strong and skilful, Cavani seems to be the ideal Chelsea striker and fans will hope there’s truth to the rumours they’ve been in touch about bringing him to west London.